1. Rear Parking Lot: Enter just north of the church into the parking lot for Wee Winks Square. Bear left to enter the gravel parking lot behind the church. Entrance to the church and chapel is accessible from the walkway. 2. Wee Winks Square Parking Lot: All parking is available except for the two spaces next to the vegetable stand. Vegetable stand is open only in the summer. 3. Sweet T's: Across the street from the church, you can park in the lot that accesses Sweet T's coffee shop. 4. Nags Head Hammocks: Located just south of the church, worshipers can park in the half of the lot closest to the street. 5. PNC Bank: Across the street and south of the church, this parking lot is fully available and only a short walk from the church. 6. 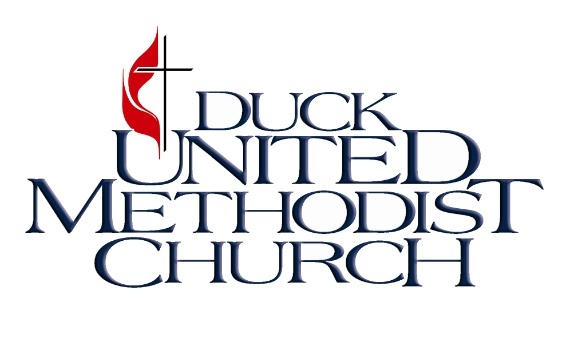 Town of Duck Town Hall & Park: For those extra crowded worship days, the Town of Duck buildings are located south of the church on the soundside. The parking lot in front of the town buildings is available for church parking as well as the parking behind the Duck Town playground.